Highway signage is supposed to PREVENT car crashes but, sometimes, the road engineers seem like they are playing with us or … maybe they don’t actually drive so can’t understand the confusion of something like this. Please, signage “experts,” traffic engineers, guy that has the 3/4″ hexagon ratchet wrench in his tool belt that fastens the signs on the thingies… You don’t see anything wrong, dangerous, stupid about this? For crissakes… what am I supposed to do while I am driving at 50 mph, relaxing, talking on my phone, changing my iTunes songs, eating an ice cream cone and look up at this signage? 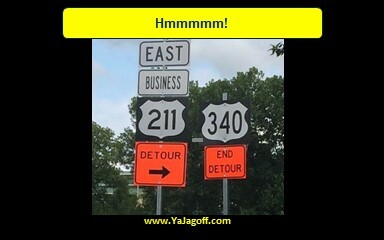 This is the road sign version of a run-on sentence … Ya Jagoffs! Thanks to @YinzerTracy on Instagram for the pic and for being today’s Honorary Jagoff Catcher!